The thing is, it can be hard sometimes to measure change. 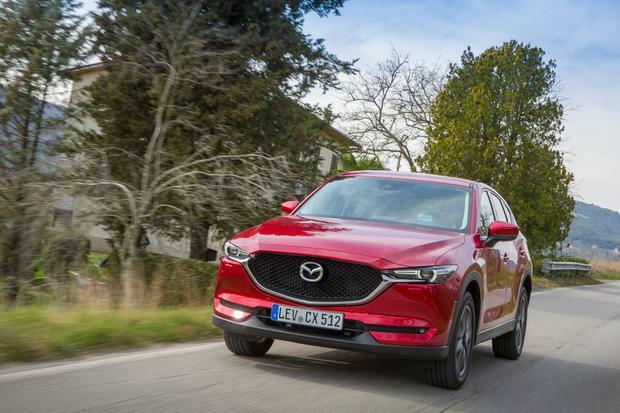 Take the latest Mazda CX-5 mid-size Crossover/SUV. From the side or rear, you'd have to work hard to pick out any major shifts in design. The shape is much the same. So are the engines and so is the overall feel and fit of the car. And yet there is change. In some areas invisible but substantial, marginal in others. The prevailing sense is one of evolution. Far and away the biggest step they've taken to distinguish the new generation from the old is the seriously strong front end. You'll have no problem picking out the 2017 summer incarnation from its predecessors. After that it's a matter of emphasis. There is a change on price too - it's up around €1,000 - but you'd expect that. The CX-5 is due here early June. It will have the tried-and-tested 2.2-litre turbo diesels (150PS or 175PS), and a 2-litre petrol (165PS). Not much change there. You can have 6spd manual or auto transmissions. Most people will buy front-wheel-drive versions, but the i-ACTIV AWD system with auto box is expected to feature more than before. Understandably, the 2.2-litre diesel (from €31,495 for the 150PS 2WD) will be the big seller, but I liked the petrol on a 'town run' around Barcelona. We sampled the AWD/automatic combination too on a good stint on mountain roads in the 175PS version of the 2.2-litre diesel. The 6spd transmission was, however, slow to kick down. And we drove the 150PS diesel with manual box. It is probably the one to go for, though in pure performance terms the 175PS brought a degree of life to proceedings. This can be a hugely price-sensitive area of the market. Most marques get an entry-level model in well under the €30,000 mark. That gets people 'started' but, it seems, many then opt for better-specced trim levels. Realistically the starting point for the CX-5 will be €31,495 for the diesel 2WD Executive (150bhp) - the bulk seller. The petrol does start from €28,995, but few are expected to buy one. The CX-5 is a popular car. They sold 700 last year and plan on similar levels of purchase for next year (they say they are being realistic because of an expected dip in the overall market). They regard the Volkswagen Tiguan as their key rival. That's ironic in that Volkswagen only recently began really competing in the lower end of the segment with a new 1.6-litre diesel version against the Hyundai Tucson, which has been the runaway favourite for a couple of years now. However, there is every reason to conclude that people are buying in numbers at the upper end of the sector too. And that is where Mazda would expect to see themselves - semi-premium, if you like. As I say, I like the look of the front a lot. I think the grille/headlight arrangement shows a bit of daring. It reminds me of the Jaguar F-Pace, but I much prefer the Mazda look. And the car, 35mm lower, has a 'slung back' profile a bit reminiscent of the BMW X3. The rear is tucked and tidied, but not nearly as effectively as the front. It probably looks its best in the new Soul Red Crystal colour, but there is a nice demure dark blue I liked too. Inside they've quietly upgraded the cabin. There is a touch of class to fabrics and surfaces; the materials are soft on the eye and to the touch. You feel you're in a premium cabin. Small changes to the air vents and trim strips polish off a dash and front of some depth. But that 7in infotainment display annoyed me. It sits on top of, rather than in the dash and was a real let-down. Too small, pokey and the graphics are mediocre. Some versions have a Heads-Up Display and electric tailgate lift. The seats got the update treatment too, but I'd have liked a bit more side support when on twisty roads (and we were on a lot of those). The other major change is one you can't really quantify (though they produced figures attempting to do so). It is the reduction of noise into the cabin. It is now nearing if not equalling premium quality. Some techno additions such as G-Vectoring Control (adjusts torque levels to the wheels depending on what the steering wheel is doing) are of interest, but again difficult to calculate in terms of adding that much. I would have liked less bodyroll - we fairly shifted over the narrow mountain roads - but I don't think you'll notice too much of it in the vast majority of your drives. It's comfortably, rather than dynamically, sprung. Overall progress has been made, no doubt. The real change, I suppose, has been in lifting the level of overall accomplishment. The cabin is the outstanding area of real improvement, and isn't that where you're going to be most of the time? There are things I would do differently, yet it is unmistakably a Mazda crossover and that means gradual rather than dramatic/obvious change. Standard spec includes LED headlights, 7in colour touchscreen and Smart City Brake Support (SCBS). Typical spec on the mid-trim Executive SE includes LED fogs, folding rear seats, four USB connections, DAB radio, dual auto air con, front/rear parking sensors, cruise control, Hill Hold Assist. Platinum adds 19in wheels, electric tailgate, black leather seats, 10 BOSE speakers, rear-view camera.